Three years have passed since BMW shocked us all with the introduction of i8. Beside surprisingly futuristic appearance, Munich made the sports car with a three-cylinder engine. By the way, brand’s smallest model M140i has inline six, and sports car we have here has a fuel efficiency of 112 mpg combined. It will surely pave the way for more affordable hybrid sports cars contrary to LaFerrari and McLaren P1, and soon after it, Honda NSX and Lexus LC arrived, though luxury Toyota was always inclined toward that type of powertrain and would do it anyway. In an effort to keep things interesting German company chose to shower us with an abundance of special color choices. 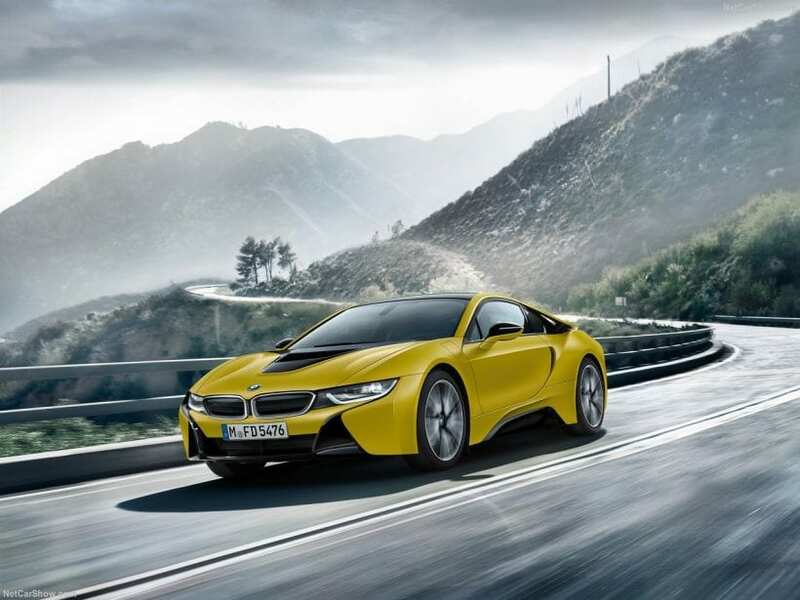 After Protonic Red Edition, Protonic Dark Silver Edition, Concours d’ Elegance Edition, and Protonic Frozen Black Edition which we wrote about recently, we also have 2018 BMW i8 Protonic Frozen Yellow to review this time. None of the color themes change anything about the shape or design, it simply uses different paint jobs to affect your visual senses. In this case name obviously points that yellow is the main thing, while we should add that shade of it is quite interesting and distinct. It is joined by especially “glowing” black or in BMW’s dictionary Frozen Grey, covering grille, parts of the bumper, hood, mirrors, and tail, along with the whole roof and side skirts, in short, all parts that were already in black, but not in this kind of black. It also has special 20-inch alloys with three spoke design. The cabin also got its share of yellow. The black interior is contrasted with double yellow stitching covering seats, dash, lower console, doors and floor mats. Besides that, the headliner is anthracite-colored, seat belts are gray, shifter and iDrive knob have ceramic inserts, and finally, you have door sills with “Edition” lettering. That would be also, exactly what you get with Protonic Frozen Black Edition on the inside. As you are already accustomed, none of these special editions change anything under the skin. 1.5-liter turbocharged I3 petrol engine delivering 231 horsepower and 236 pound-feet of torque is still here. It is assigned for rear wheels, while electric motor rated at 131 horsepower and 184 pound-feet of torque power the front ones while being supplied by 7.1 kWh lithium-ion battery which allows 15 miles of pure electric drive in EPA cycle. Total power output is 362 hp and 420 lb-ft of torque enough for reaching 60 mph in 4.2 seconds. There is absolutely nothing different to be said about this “special” version compared to any others. 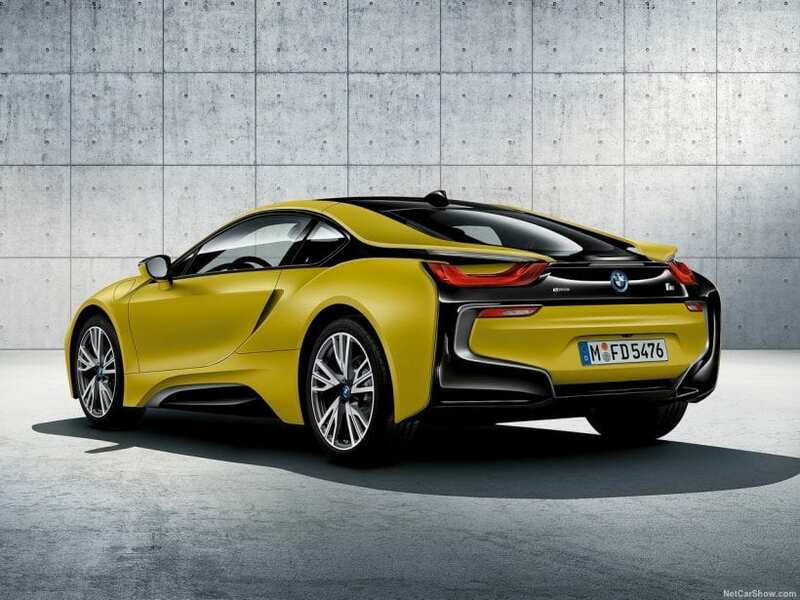 Everything we said for Frozen Black Edition is valid for 2018 BMW i8 Protonic Frozen Yellow also. If you are planning to buy i8 and yellow is your thing, go for it, but be quick as this is limited production model and it goes on sale in September this year. Truth be told, this is just another body paint, and all those “special editions” monikers are more overstretching than actually special. Price starts at around $140k, and you don’t have to worry if you miss this one because even if you go with “regular” version, you’ll get more than one body color and berserk look inside and out.